The Globe and Herald has coverage of Vertex Pharmaceuticals announcing that they're going to move to Fan Pier. They'll receive $10-12m in government funding and another $50m in infrastructure loans to support their move across the river from their current locations in Cambridge. 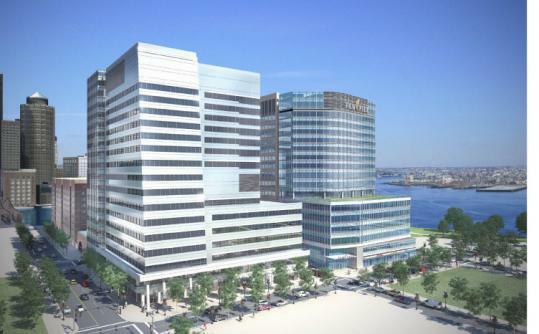 Cambridge-based Vertex Pharmaceuticals has signed a letter of intent to lease two as-yet-unbuilt office towers in the Seaport District’s Fan Pier area and provide 500 new jobs in exchange for tens of millions in subsidies. Vertex was lured, in part, by a Tax Increment Financing offer of up to $12 million in tax incentives and $50 million in public infrastructure improvements in exchange for a promise to hire 500 new workers by 2015. The deal is expected to bring $60 million in new tax revenues to the city. In one of the largest office deals in recent Boston history, drug maker Vertex Pharmaceuticals Inc. will move into two new buildings in the Seaport District, catapulting the city’s effort to transform the waterfront into a neighborhood of technology companies, academic institutions, and medical firms. Vertex yesterday signed a letter of intent to relocate its headquarters from Cambridge to the Fan Pier complex in late 2013. The 23-acre development has just one tower now, but is slated to have eight buildings of offices, residences, stores, and hotel rooms, as well as parks and a marina. The deal is a watershed in Boston’s campaign to court a biotechnology industry that has largely eluded it, with most drug companies preferring to be closer to Cambridge’s prestigious universities or out in massive suburban office parks that offer cheaper rents and room for expansion. Variance for Hotel at 364 Congress St.